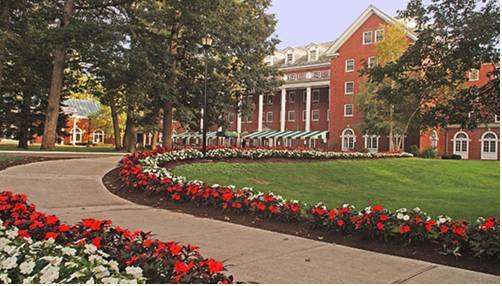 The Gideon Putnam is a Historic Property located in the 2300 square acres of Saratoga Spa State Park. Also located adjacent to the hotel is the historic Roosevelt Spa. The Saratoga Performing Arts Center is also situated in the park. This is the summer home to the New York City Ballet and the Philaharmonic Ochestra. We offer golf and tennis and summer swimming or bicycle rentals. A wonderful place for walking. Winter activites include cross country skiing and ice skating. We area mile from downtown Saratoga Springs and two miles from the Throroughbred Race Track. Inside the hotel we have our Lovely Geortian Dining Room offering breakfast and lunch and dinner and our Hallmark Sunday Brunch. We have a grille serving lighter fare in a more casual setting. The Gideon Resort and Spa is located 30 miles north of Albany New York and 175 miles north of New York City. The ideal surroundings to relax and enjoy the ambiance of the Gideon. The Saratoga Grille offers a selection of light sandwiches and salads and appetizers all day long. A perfect place to relax and unwind. Experience the innovative menus and daily specials while enjoying the friendly atmosphere that makes an evening in the Georgian Room a must. ~22 miles from Saratoga Springs. Dip the special spoon into the smelly water and drink deep -- you should feel better soon. This old spa town has many decrepit healing hotel and spring remnants to admire. ~45 miles from Saratoga Springs. ~50 miles from Saratoga Springs.